Screw tonemapping: long live enfuse! 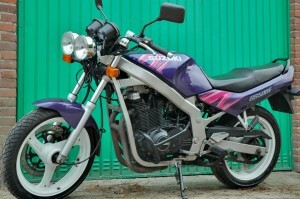 Because I recently bought a new motorcycle I wanted to sell my old GS500. Most important when selling your stuff online: good pictures of the item you’re selling. So I dusted of my Nikon, gave my trusty Suzuki a nice cleaning and started taking pictures. With HDR in my mind I used a little tripod and took 3 pictures of every position with the bracketing function. +2EV, 0EV and -2EV. No raw but plain jpeg’s. For some reason I don’t like raws. It just takes too much time to get them ready for publishing. I shot 10x3 pictures, uploaded them to my laptop and started looking for some HDR/tone-mapping software for linux. Qtpfsgui looked very nice and I tried it out. It was available from the ubuntu repositories. I have the Intrepid repositories enabled and installed hugin-tools (a dependency for qtpfsgui) from there. The added benefit was that qtpfsgui could align the pictures for you. I used a tripod but I didn’t use a remote control. So some pictures were not perfectly the same. Qtpfsgui seemed like everything I needed: a nice gui, automatic aligning of images and a lot of different algorithms for creating tone mapped images. But I couldn’t create a realistic tonemapped image. Qtpfsgui creates a lot of those fantasy-like HDR images. Nice if you like the style, but I wanted realistic images. Exit qtpfsgui. And it worked perfectly. Without any tweaking of the parameters, it resulted in a nicer, better looking image than with a fully tweaked qtpfsgui. Perfect! I would really recommend enfuse. Maybe I’ll create a small ruby script to ease this process.